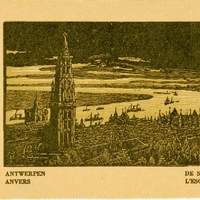 A postcard depicting an aerial view of the Scheldt, a river in Antwerp, Belgium. The river runs from northern France through western Belgium and southwestern Netherlands. The tallest building in the postcard is the Cathedral of Our Lady, a Roman Catholic cathedral founded in 1521. "Question of the Scheldt." World Digital Library. http://www.wdl.org/en/item/9195/. “Scheldt in Antwerp Postcard.” RICHES of Central Florida accessed April 22, 2019, https://richesmi.cah.ucf.edu/omeka/items/show/6660.